We’re pleased to announce the arrival of a new range of greeting cards brought to you by the witty mind of Joel Zerner! Joel is a web developer in Adelaide who loves board games, Mexican food and dad jokes. He’s pleased to contribute to Noteworthy Cards because he wants to share his ideas and make a difference for people in need. The Zerner Collection comprises four novelty greeting cards that are sure to be received with a laugh. 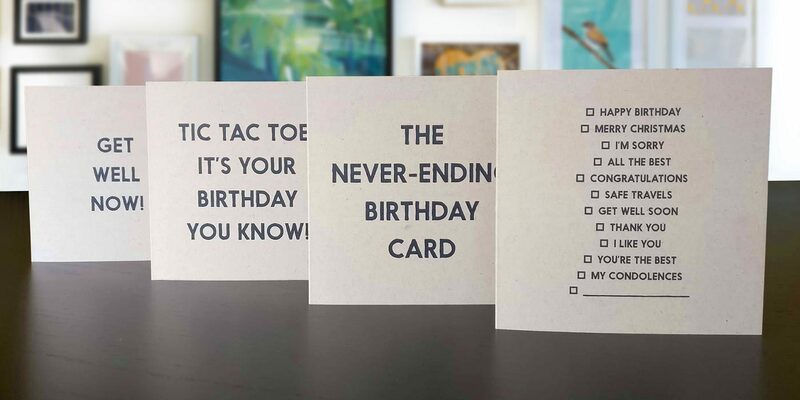 From a multi-purpose greeting card to a never-ending birthday card, you’ll have a fun time giving these cards to your friends and family. These brown recycled cards are FSC® Mix certified, produced from 30% post-consumer waste, and manufactured carbon neutral by an ISO 14001 certified mill. 100% of profits from these cards will fund life-changing gifts for people suffering in poverty. Noteworthy Cards is an Australian social enterprise selling greeting and encouragement cards while donating 100% of profits to fund life-changing gifts for people suffering in poverty.